otherwise cold laser alone is $60 for each session.. The goal of laser therapy is to deliver light energy units from red and infrared laser radiation, called photons, to damaged cells. It is the consensus of experts i that photons absorbed by the cells through laser therapy stimulate the mitochondria to accelerate production of ATP. This biochemical increase in cell energy is used to transform live cells from a state of illness to a stable, healthy state. 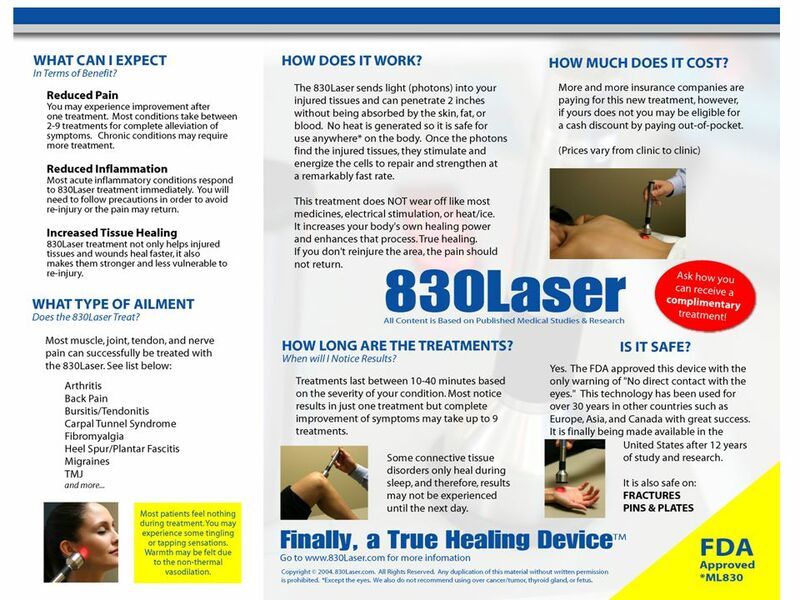 Over 4000 studies have been conducted in recent years to validate the effectiveness of cold laser therapy. Cold lasers treatment systems may be cleared by the FDA. It can promote healing, decrease pain and decrease several components of the subluxation complex.